(Bloomberg Opinion) -- Silence isn’t always golden. It has been a nervous 11 months for Emirates NBD PJSC shareholders since Dubai’s biggest bank agreed to buy Turkey’s Denizbank AS. The deal’s progress wasn’t clear, stirring doubts about whether it would actually be completed and at what price. Wednesday, however, brought relief with confirmation that the transaction will go ahead at a lower price than the $3.2 billion originally agreed. The rally in the buyer’s stock looks justified. This is strategically important deal for Emirates NBD: It helps the group to diversify away from the United Arab Emirates and brings useful digital expertise, too. Denizbank’s owner, Sberbank PJSC of Russia, was a willing seller. The snag was getting the transaction to work financially. Since the deal was agreed, the Turkish currency has fallen almost 20 percent against the dollar, while valuations of Istanbul-listed banks are also down around 20 percent on a price-to-book basis. The new purchase price of 15.48 billion lira ($2.8 billion) may be higher in the local currency – but as the agreement is to pay it in dollars, the deal will actually cost less. That means Emirates is paying just below Denizbank’s most recent book value, compared with nearly 7 percent more previously. At first glance, that discount is less than the sector fall would warrant. But the first agreement included a clause requiring Emirates to pay interest on the original purchase price until the deal was completed. There’s no mention of that in the new terms. Strip it out, and the valuation adjustment is bigger than it looks. 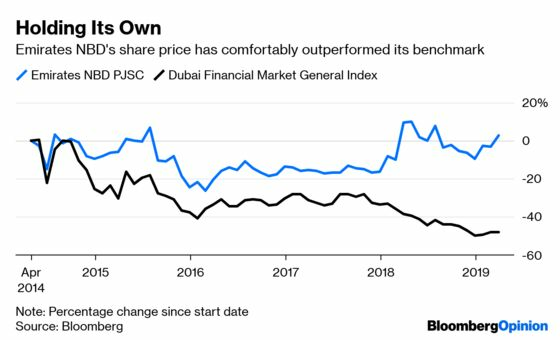 Given the unexpected boost, it’s not hard to see why Emirates NBD gained $1 billion in market value in response, bringing its total to more than $17 billion. That’s a useful fillip. With the likelihood of a rights offering to finance the transaction increasing, according to Bloomberg Intelligence, raising equity with your stock at a post-crisis high isn’t a bad position from which to start. Or at least, it’s something good to talk about. Chris Hughes is a Bloomberg Opinion columnist covering deals. He previously worked for Reuters Breakingviews, as well as the Financial Times and the Independent newspaper.